Greetings! I recently purchased a black 94 RX-7 to replace my dead 03 WRX. Originally thought it was a Touring but a little research showed its a PEP (apparently only 150 black 94 PEPs were made). It has about 100,000 miles on it and runs well. She does flood, which threw me for a loop at first but a quick search revealed the deflooding methods. I did a lot of weight reduction on my WRX and am planning to do the same here (while keeping the twins). I have already pulled the entire A/C, and the emissions stuff is next. Coupled with simplified wiring harnesses I'm working on, deleted Bose, I should be well on my way to at least removing my own weight from the car (240 lbs) Seats are a big one, as is the cast iron in the exhaust. There can be a decent amount of enjoyment in finding something not needed or a lighter way of securing something etc... Just from the Dash, Instrument, and Rear harnesses I have about 3 lbs of tape and plastic bits, plus the extra wires and connectors. If anyone has Front, Emission, Floor, or Door harnesses please hit me up! Last edited by b3delta; 11-20-17 at 09:53 AM. Welcome! Very nice to see a new owner that has spent some time doing research. Mods on these cars are a slippery slope. Enjoy! It's the oil temp gauge that isn't working properly not the oil pressure. Sadness! The Army has decided to move me to Ft Carson Colorado. As of now I will probably only have a 1 car garage and can't justify leaving the RX7 in there as my wife would kill me, so it is probably going to be stored for the 3 years until I return to NC. If I do end up getting a 2 car garage, I will have her shipped out to me in CO to be able to work on it. CO apparently gets some nasty hail and I don't want to risk ruining my precious FD. However I have plans and some updates. The headlights work now, just needed to open up the retractors and clean the grease off the contacts so they both work flawlessly now! The oil temp gauge is just not connected to the sensor and that's why it doesn't read. The tachometer works when its really hot outside and the car sits in the sun. I figure its some metal expanding in the heat. 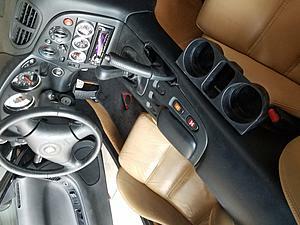 But I'm planning to get a whole set of speedhut gauges so it all matches and can get wired up nicely. 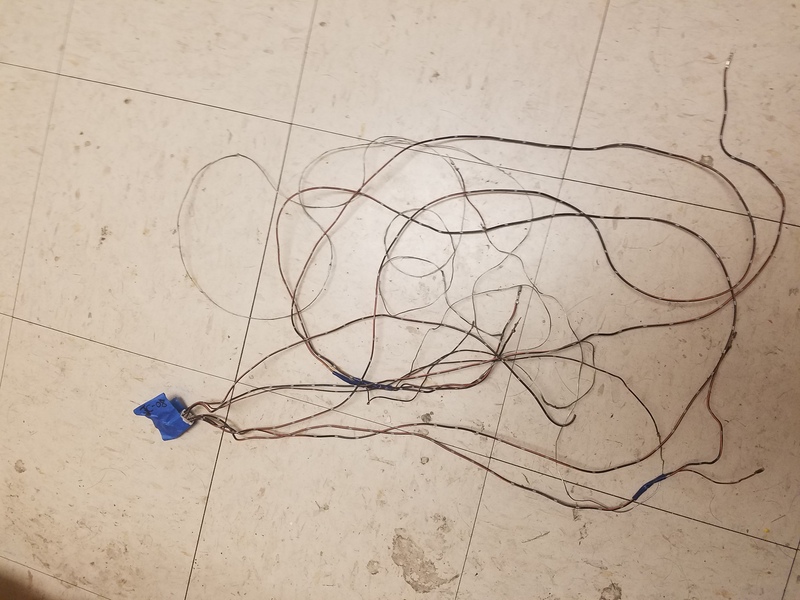 I would like to acquire a beat up FD and take the entire car's wiring harness to rebuild it with new wires and possibly connectors so that I have a new, and lighter harness to drop into mine when I get it back. Remove connections and wires to unneeded stuff (Bose, rear wiper, cruise control, etc.) and wire in spots for new sensors for when I buy an Adaptronic ECU. A guy on norotors.com makes incredible floormats and trunk carpet. I'm having him make me some black ones with red efini logos in the center of them. 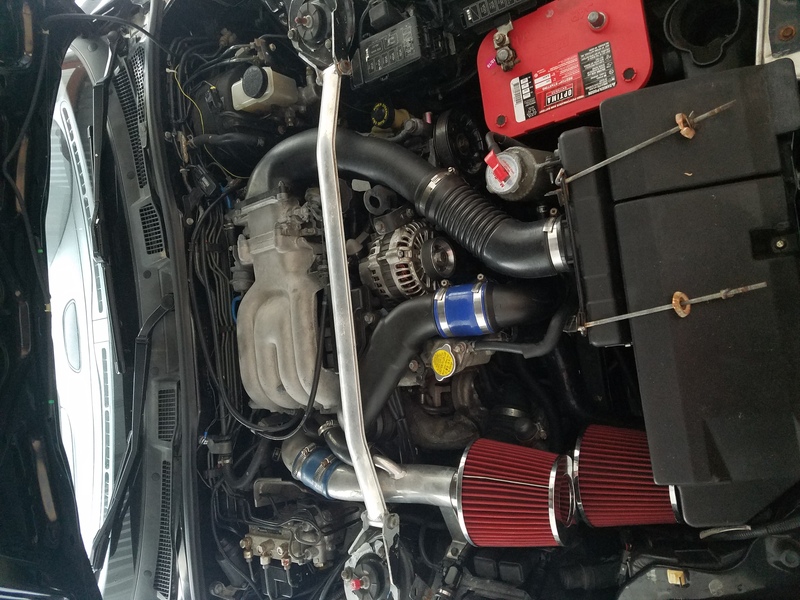 I've tried looking at different mods and DIY stuff but it seems there's not much in that dept for the FD, at least in comparison to the WRX world I previously lived in. But there's also the idea of keeping the car clean and looking as it deserves to. I also want a new steering wheel, a flat bottom, since I'm 6'4". I like the Momo 27a with the cutout but don't trust myself to drill the holes for the hub centered. Removing rest of the A/C. Entire system is for sale/trade. 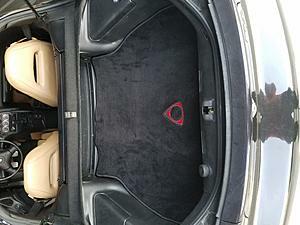 IMO a decent car cover beats abandoning it for 3 years (there are outdoor versions that are made to withstand minor hail). If you store it, fill the radiator with 100% quality coolant (eg Shell Rotella Ultra ELC) and run it through the engine. Also top off your fuel tank and add plenty of anti-gel. 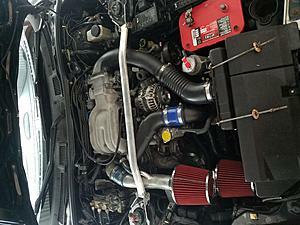 On the way, 185 degree fan switch, 180 degree thermostat, Pettit air pump delete kit, heated O2 sensor. Just bought another LIM, UIM, TB to port match, and remove unnecessary stuff, will remove ACV, EGR, AWS upon install, hopefully with a thermal coating. Decided to ship the car to Colorado with me, just store it there so I can work on it. Arrived in Colorado, car works well despite the altitude, though they only have as high as 91 octane here. trying to install the stock foglights, can't find the mounting points. Discovered a set of rear speaker mounts in my box of goodies from the previous owner, really made my day! Fabbing phenolic spacers for intake, bought an efini y-pipe, JasonS floor mats arrived!, installed one rear speaker - no sound though weird. need to fab brackets for foglights, anyone have a picture of what they look like? there isn't much help in the FSM or even google for the OEM foglights brackets, they aren't on the bumper or rebar. You should be able to get factory fog light brackets out of the FS section for cheap. I'm sure Fritz or Tomsn16 could help you out. Let us know how the spacers work out. Most people find they warp and leak in our application. Phenolic spacer is done! Lots of Dremel work but it's finally complete. Need to buy 2 UIM-LIM gaskets to sandwich it and prevent leaks. Then fire up the car get a heat reading on the UIM, swap the spacer in, heat it up and temp again, hopefully all this work is worth it. If it is I'll fab up a few more for selling, prob charge $75 each (good amount of labor in making it, plus price of dremel bits and the sheet itself) - not to mention posting results for all to see. They're only about 2 inches wide and I bought a 24x12" chunk of Garolite. 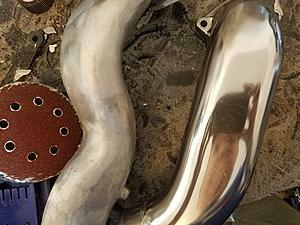 Also began to PnP the manifolds, TB, efini Y-pipe, crossover pipe, and rear turbo inlet. 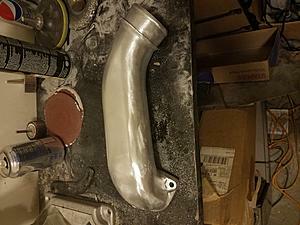 Manifolds getting port match and a lot of "milling" out excess - gonna find a welder to close holes. everything else before the TB butterflies getting a "as polished as I can" interior, also cleaned up the exterior of the Crossover pipe, it's no Robinette polishing, but a hell of a lot better than before. 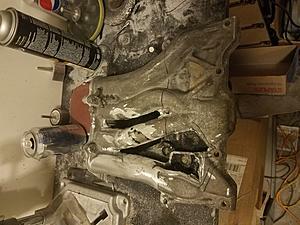 Milling the manifolds is laborious! Dremel was taking way too long and I was flying through bits, apparently this is some interesting aluminum, seeing as its ruining my tungsten dremel bits. So I bought and angle grinder and what a difference! 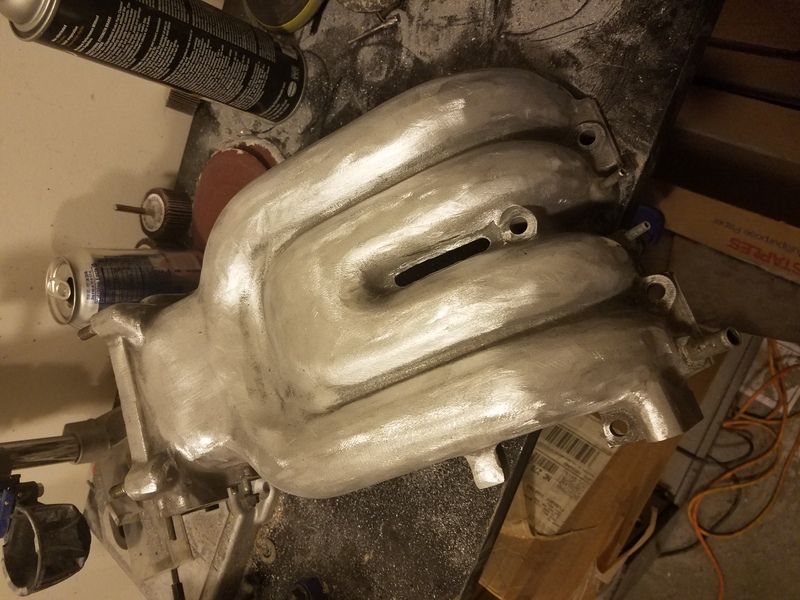 Also have some aluminum specific bits on the way for the more detailed work. Cut off a lot of the excess on the LIM, everything that had emissions stuff bolted to it - GONE. Also going to polish the manifolds exterior to look better than sand casting. Finally putting some pictures up. 3 are the interior with the JasonS floormats, pretty sure he has a group buy going on right now. And an engine bay shot, because engine. Polishing progress is so slow! Every time I get a good shine going I find a spot that has a deep gouge and need to go down (up?) a grit. The crossover pipe is starting to look pretty damn good though, its been sanded down to an 800 grit, so the polishing wheel is next, once I triple check there's no bad spots left. LIM is very slow going, I'm still working on cutting out the unneccessary stuff. Are the vacuum pipes that run through the LIM (between front primary and secondary) needed if all the emissions solenoids are being deleted? The UIM and TB have some very difficult spots to reach due to all the vacuum lines and stuff, those will be tough, may need to do some of it without power tools..
Haven't done much in a while, too cold in CO and I haven't bought a space heater for the garage yet. Made the templates for LIM-engine, y pipe-turbos, and intake pipes - turbos on the phenolic sheet. And have 2 gaskets for each one to sandwich the spacer and seal. Left the emission holes on the LIM closed. 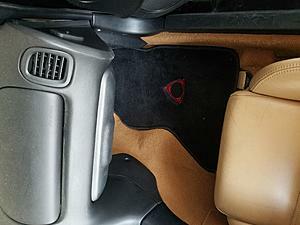 Bought a metal dead pedal and OEM gas pedal in the group buy - looks awesome. Have a whole new set of vac hoses and a new driver's door seal. Car is in pieces, I'm working on removing the extra stuff (bose, rear wiper stuff, antenna motor, etc...) as well as getting the wiring harnesses lightened and new connectors (huge project, and slow). 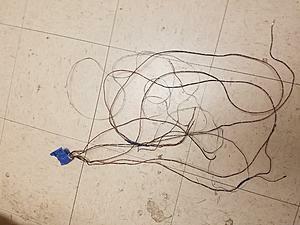 I have a huge bag of removed stuff from wiring harnesses - tape, plastic, loom, excess wires. its got some weight to it. Some of the ground connections are weird though, y-connections branching out which makes me need to cut instead of just de-pin. Have a set of braided OMP lines to go in as well. Anyone know if defined autoworks is still in business? I sent an email and got no reply. Have a new interior carpet coming, black. to replace the tan OEM one. Need to find a place in CO that I can try out seats at. The ones I had on my WRX were a little tight on the hips and the fabric wore fast from getting in and out. Last edited by b3delta; 03-02-18 at 04:23 PM. nice build, man. have you met any of the forum members there? there are a few I know of and met up with on my monthly trip to the springs. My FD is in So Cal til the end of summer, but I might take my RX-8 on my next trip. Whilst taking a break from polishing aluminum, I did some more work on the wiring harness. Speedhut gauges are here!!!! Time to modify the gauge cluster to fit em and wire it up all clean with a Delphi 24 pin connector. It is amazing how much wiring can come out just for switching from Bose to standard and no center speaker. I'm somewhat tempted to make a large spreadsheet of connectors and which wires go where, make it easier than thumbing through the FSMs - especially with X connectors. Last edited by b3delta; 04-13-18 at 07:29 PM.